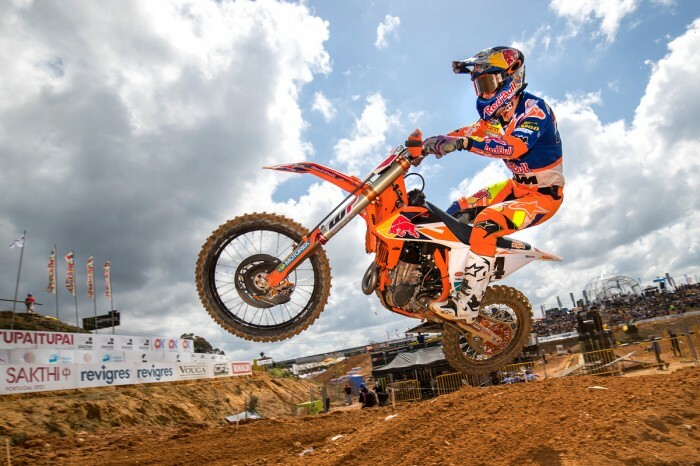 Jeffrey Herlings (Red Bull KTM) dished out a racing master class at the MXGP of Portugal today, round five of the FIM Motocross World Championship, as cracks began to show in his relationship with team-mate and defending champion Tony Cairoli. The 23-year-old Dutchman won both 30-minute plus two lap MXGP motos around the punishing Agueda circuit from Cairoli. His opening race advantage was over six seconds and his second more than half-a-minute – even after a small fall – as the veteran Italian struggled to keep up. Race one was a wire-to-wire win for Herlings who took the holeshot after giving 2016 champion Tim Gajser (Team HRC) a love tap halfway down the start straight but he needed to make a series of rapid first-lap passes in race two when Cairoli moved over on him out of the gate. Still, as we saw last time out at the MXGP of Trentino in Northern Italy, Herlings appears able to drop his lap times at will – an ability that can only serve to demoralise his rivals and establish a psychological advantage as the championship reaches its first quarter. “I pulled a pretty good start [in race two] before Tony cut me off,” he said. “I still managed to get past him in the first lap and make a good gap. Then I went down unfortunately and lost a few seconds right there but managed to get a big lead again. Cairoli’s pair of seconds – both coming after he was forced to string passes together – were an exercise in damage limitation but he now trails Herlings, who has won seven from 10 motos and never finished outside the top two, by 16 points. Slovenia’s Gajser ran three-five to take his first podium finish of the season but both Clement Desalle (Monster Energy Kawasaki) and Gautier Paulin (Rockstar Energy Husqvarna) suffered serious setbacks. Belgian Desalle exited the opening moto on lap four while running third with what appeared to be a clutch problem while the Frenchman’s second race ended on the opening lap with a technical issue. As a result 2015 world champion Romain Febvre (Monster Energy Yamaha) moves past Desalle – who chased Cairoli home in race two – into third in the championship fight after the Frenchman posted solid five-four finishes. The British contingent was reduced to just two riders with Max Anstie (Rockstar Energy Husqvarna) still not sufficiently recovered from a concussion sustained at round three at Redsand in Spain and Tommy Searle (Bike It DRT Kawasaki) not expected to return to MXGP action until Latvia on May 13 following his broken collarbone at round two at Valkenswaard in Holland. Shaun Simpson (Wilvo Yamaha) headed into Portugal with a shoulder injury but toughed it out in the deep ruts with his 11-11 scores good enough for 11th overall to maintain his 12th place in the championship. The Scot even holeshot the second moto – despite Febvre being credited with it – but faded on possibly the most demanding circuit we’ve seen so far this year. Graeme Irwin (Hitachi ASA KTM UK) had a much tougher day. Exiting the opening race at half-distance, the Northern Irish rider was running in the points early on in race two but slipped back to 23rd at the flag. The series now takes a weekend’s break before resuming with the MXGP of Russia on May 1.